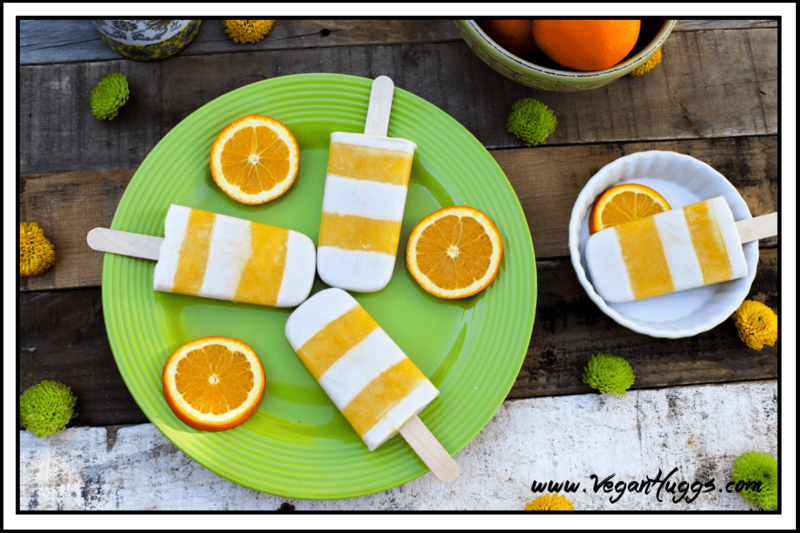 The orange tangy flavor combined with creamy vanilla makes these Orange Creamsicle Pops a treat to remember. Ok, I know it’s freezing for most people right now, and ice cream is probably the furthest from everyone’s mind. However, I was given a special request from my little man and Ice cream is always on his mind! Also, It has been a bit warmer in my neck of the woods. Last week we visited a local citrus orchard and we bought a ton of deliciously, ripe oranges. In our minds, we were thinking fresh OJ all week, but our little nugget had something else in mind, apparently. The bag of oranges we bought, looked almost as tall as Grant, and he was fascinated with them. 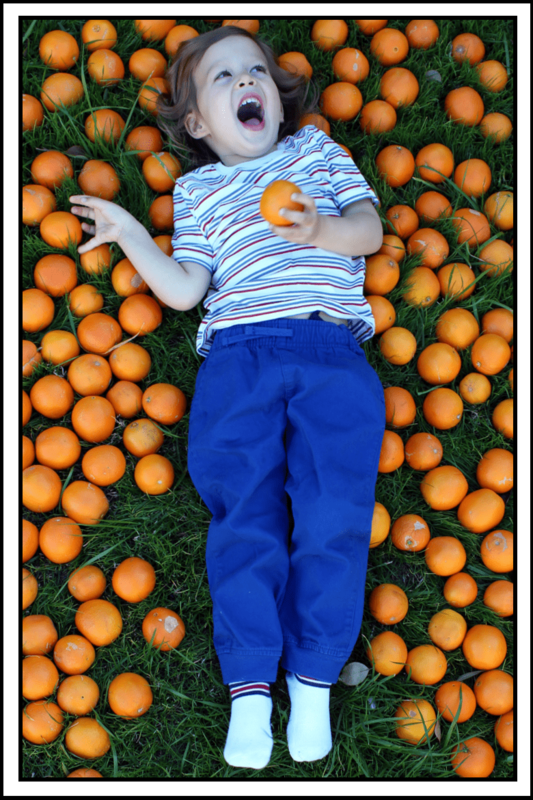 So, I thought it would be really cool to lay him on the grass with all the oranges around him. He’s not always cooperative when I take his picture, so I really have to engage him. While he was in the oranges, I asked him what we should make with them. He immediately yelled “Ice cream!” I quickly snapped the photo and it came our perfect. So much happiness for something so simple. I love it! Adults can really learn a lot from children. We had plenty of oranges to spare, so I decided to make him a sweet orange treat. I originally thought to make orange sorbet, but I knew he would love something creamier. So, I thought back to what I loved, when I was a kiddo myself. One of my top favorites to order from the ice cream man, was an orange creamsicle. Delicious! I don’t even want to think of all the chemicals that were in there though. 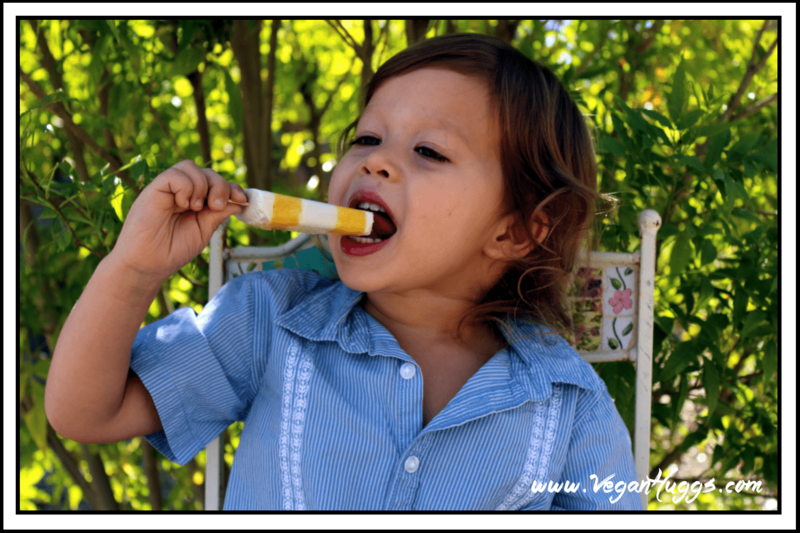 One thing I clearly remember with those creamsicles, is carefully licking the orange flavor off, just so I could enjoy the vanilla separately. I suspect, I’m not the only one who has done this. Well, these striped creamsicle pops give you the option to have both flavors separately or together. Isn’t that wonderful? These pops take a few extra steps to create, but I think they’re so much better this way. Grant was so delighted when he tried these for the first time. It was so worth seeing this face of content. Mix together the vanilla layer ingredients in a bowl. Combine well. In a separate bowl, mix together the orange layer ingredients. Combine well. Pour the vanilla 1/4 of the way into your mold. Pop in freezer for 20 minutes. Pour the same amount of orange layer on top of the vanilla. Freeze 20 minutes. Keep repeating this step until your molds are filled. Push the stick in about 1/2 way. The last few layers should be soft enough to push through. **Prep time doesn't include freezing time. Here are the popsicle molds that I used for these creamsicles. They are BPA free. I used these popsicle sticks instead of the popsicle mold sticks. They aren't needed, but I like the look of wooden sticks. 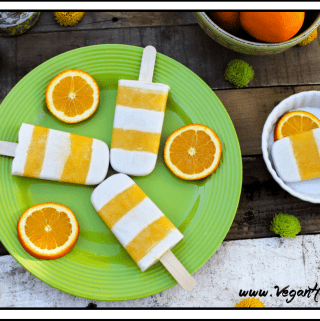 If you make these Vegan Orange Creamsicle Pops, I’d love to hear from you. Leave a comment below and let me know what you think. It would really make my day. You can also follow me on Instagram and share your creation with me, Just tag me @veganhuggs and hashtag #veganhuggs. 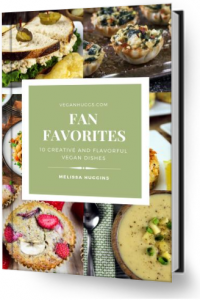 Vegan Huggs is a participant in the Amazon Services LLC Associates Program, an affiliate advertising program designed to provide a means for sites to earn advertising fees by advertising and linking to amazon.com. This post may contain affiliate links which won’t change your price but will share some commission. There will be no additional charge to you, if you purchase an item through an affiliate link. I will only link items that I use myself.